Stay protected and worry-free with our secure solutions for businesses of all sizes. Whether you work from a small office or out of your home, the Tabletop Firebox is ideal to keep your environment secure. Working remotely? 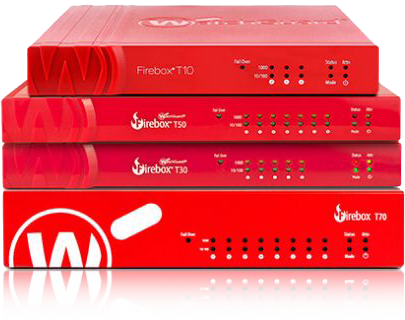 The Firebox models are perfect for keeping your remote employees securely connected. This is the perfect stand-alone solution for small to mid-size businesses looking for an easy to deploy secure and essential appliance with full UTM protection for your organization’s users. This line of firewalls are engineered to provide solutions for small to midsize enterprises that are struggling with keeping their network secure. A range of models will keep be your line of defense against: spyware, malicious applications, data leaks and more. Top of the line protection to keep your growing organization secure today and against the cyber-attacks of tomorrow! Organizations of all sizes can benefit from our premier line of wireless solutions. Our solutions offer a suite of services to stay secure and protected, easy management for users and administrators, and support organizations of all sizes and types. Have a small office? Need a rugged product for the outdoors that will stand against whatever Mother Nature has to throw at you? We have you covered! Last quarter we saw a rise in sophisticated #phishing attacks targeting banking credentials. See all of the insights from our latest Internet #Security Report here: https://wgrd.tech/2FspTVh .